It is 3326 and Nigel Sheldon, a legend in the Commonwealth that he helped to create so long ago in his interminable existence, takes the next step in his extraordinary life. The Raiel, self-appointed guardians of the mysterious and inexplicable Void construct at the centre of the Galaxy, invite Nigel to enter the Void to look for clues to the survival or otherwise of a number of colony vessels that years ago entered the Void and were lost. The Void has become a place of enchantment to those outside it thanks to the dreams of its Waterwalker which somehow, through the medium of Inigo the Dreamer, have been transmitted to eager listeners throughout the Galaxy, drawing them in to the Void. Nigel needs little encouragement. He makes the journey and the Void seals itself behind him. At the heart of the novel and Nigel’s experience lies Bienvenido, a planet populated by the descendants of starship crews. But thanks to the distortions of time in the Void, decades become centuries. Bienvenido has been settled for 3,000 years. And its not just time that differs. Humans within the Void are changed. They have innate abilities to control their thoughts and even those of animals. They read the minds of others and they live long lives. These lives, for many, are mystical and the masters of their religion are the skylords who claim their souls at death and carry them into the essence of the Void. But this is a world terrorised by the Fallers, an alien species that lives in the orbit of the planet and drops its eggs onto the surface of Bienvenido, where they seek life to kill and replace. Many humans spend their time seeking out the eggs of the Fallers, among them our hero Slvasta and it is his wonderful heroic story that fills much of The Abyss Beyond Dreams, captivating this reader at least from the moment we meet him. The first thing to mention about The Abyss Beyond Dreams is that this is a most beautiful and fitting title for a very fine novel. 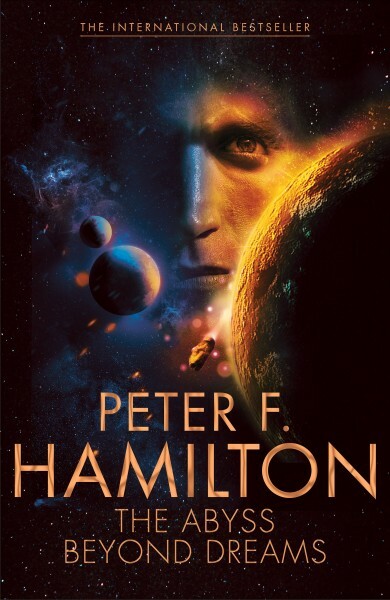 Any new novel by Peter F. Hamilton is something to be anticipated and welcomed but this is especially true of The Abyss because it takes me back to the place I have most enjoyed spending time in the realm of science fiction – the Commonwealth. The Abyss follows the original magnificent duology of Pandora’s Star and Judas Unchained and exists in approximate parallel time to The Dreaming Void, the first of the three Void books. There is some overlap but in The Abyss we see a different side to the Void although, if you’ve read all three of the Void trilogy, it’s quite likely that you will appreciate the added context. However, so far I’ve just read The Dreaming Void and far from making me feel that I’ve spoilt the trilogy by reading The Abyss it actually made me want to complete the trilogy more than ever. The Abyss takes what’s good about The Dreaming Void and magnifies it. As with the Void trilogy, and perhaps to an even greater degree, The Abyss splits science fiction with a more fantastical portrait of life on what is a very alien world despite its human population. The vast majority of the novel is landbound, following Slvasta and his followers, his growing army, as they begin to rise up against the tyranny of the ‘captains’, combined with the utterly absorbing and perilous account of Nigel’s own efforts to understand the Fallers and to escape the pull of this world. Normally, I could get restless in this kind of planet-bound science fiction tale but here we are in the hands of the master storyteller Peter F. Hamilton who knows exactly how to draw me in with the most accessible and light-filled prose, fabulous characterisation and dialogue, and the gift of hiding wonders throughout the pages, all of which are a delight to discover. I love both stories – I loved the men and women with Nigel and Slvasta, even those who weren’t entirely or even a little bit human. There are plenty of fascinating tangent stories, always a treat in a PFH novel, and I especially enjoyed Kysandra, the young girl that Nigel selects to be his helpmeet. What a life she would have endured otherwise! The beginning of the novel, however, contains one of those space stories that I doubt I will ever forget. The story of Laura and her crew caught in the Void is stunning and horrifying. We learn more about this as the novel continues and thank heavens we do because it is outstanding and what we discover is gobsmacking. I can say nothing more about it, just read it. But this also applies to the whole novel – there are so many stories to find, so many people to follow. The Abyss Beyond Dreams is a large book of approximately 700 pages, not quite the brickbook I’m used to with Peter F. Hamilton but it is immensely satisfying and captivating. It mixes its genres and is packed with surprises. I came to care very much about the planet and people of Bienvenido just as I was terrified by the Fallers and mystified and stunned by the skylords. Nigel Sheldon is a great companion through the Void. He is so old he is almost ageless and the wisdom and humour that he has learned along the way stands him in good stead here. Paula Myo makes a welcome cameo but she has some stiff competition in this novel. The Abyss, and its sequel Night Without Stars, could, no doubt, be read without prior knowledge of the Commonwealth but I would definitely suggest that reading Pandora’s Star and Judas Unchained first would add so much to the experience. I’d also say that because Pandora’s Star is my favourite novel so I never tire of urging people to read it. Not having read all of the Void trilogy, however, did nothing to mar my enjoyment or understanding of The Abyss and, as I mentioned, it actually inspired me to complete the series. There are also elements here that reminded me why I love the Night’s Dawn trilogy so much. I love science fiction that makes my jaw drop and my mind soar and time after time Peter F. Hamilton fulfills and expands my hopes. I am so pleased that he has returned to the Commonwealth and given us a novel that I want to shout about. The Abyss Beyond Dreams is a fabulous novel that I can’t even attempt to do justice to. I want to give as little as possible away. My only regret is that it isn’t twice the size. I must be patient and count the days until Night Without Stars. Recently, Tor UK kindly asked me to write my Ten reasons to love and read Peter F. Hamilton – you can read that here. This entry was posted in Review, Sci Fi and tagged Science Fiction on October 7, 2014 by Kate (For Winter Nights). I had previously read your article on the TOR blog as I have not yet read any of Hamilton’s work and put down on a list a couple to start with and after reading this I know I have to read him soon. My favourite work from this author is still The Night’s Dawn trilogy. The first book remains one of the all time top novels I have ever read for the sheer wonder and awe I experienced at what I was reading, back in the late 90s. I struggled with the complexity of the Commonwealth duology, and therefore haven’t yet read the Void trilogy although all three books have been sitting on my shelf for a couple of years. I may need to re-read the duology with a notebook to keep track of the characters and their connections (at one point in Judas Unchained, I remember skimming through the pages because I was completely lost in terms of the subplots and characters). I absolutely adore The Night’s dawn books – just fabulous. I hope if you go back to Pandora’s Star it will fall into place for you now. It can be confusing keeping up with people. I did annotate the dramatis personae at the end of my copy. The Faller with the bionics is the one that Nigel created with his captured egg (and reversed time after his ANAdroid was rejected by it). That’s explained in the flashbacks to Nigel’s arrival and his adventures with Kysandara.